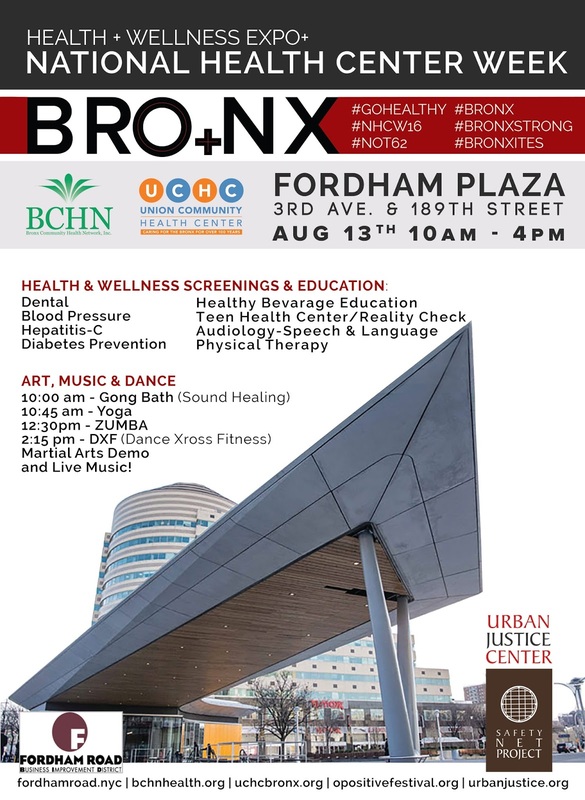 BRONX, NEW YORK, August 13, 2016 – In celebration of National Health Center Week, Bronx Community Health Network (BCHN) and Union Community Health Center (UCHC) partnered with O+ Festival, Urban Justice Center and the Fordham Road Business Improvement District (BID), as well as a number of other community-based organizations, to bring the Bronx together for an innovative Health & Wellness ExpO+ at Fordham Plaza from 10am-4pm. Bronxites are invited to participate in health screenings and wellness activities including Dance Xross Fitness, Yoga, Gong (sound healing), Zumba and Martial Arts. For the seventh straight year, the Robert Wood Johnson Foundation ranked the Bronx the unhealthiest county (62 out of 62) in New York State; nevertheless, there are signs that the Bronx is finally improving. In keeping with National Health Center Week’s (NHCW) theme this year, Celebrating America’s Health Centers: Innovators in Community Health, BCHN, UCHC, O+Festival, Urban Justice Center and the Fordham Road BID came together and planned this event around a common goal: To inform the Bronx community of the various health services and resources available to them. This collaborative event furthers the reach of #Not62, which addresses various social determinants of health like limited accessibility to healthy food, affordable housing and green space while also creating slow and steady change in terms of meeting healthcare demands in the Bronx. “As providers, policy makers and trusted safety-nets in the Bronx, we have a tremendous responsibility to increase access to quality healthcare by spanning our presence across a wider demographic within our catchment areas,” said Union Community Health Center CEO Dr. Douglas York. “We further the reach of community health center care through partnerships such as this one, allowing us to inform and educate the community of the expansive services available to them right in their neighborhoods, continued Bronx Community Health Network CEO Eleanor Larrier, MPA. Community Health Centers now serve over 24 million people (or 1 in 14 Americans) as the largest and most successful system of primary healthcare. With 44 million uninsured people in this nation and another 56 million who, although they may have health insurance, live in areas without doctors and basic health services, these partnering organizations are working to raise awareness of the needs that exist in underserved communities and the high costs of failure to provide primary care and preventive health. Health centers not only prevent illness and foster wellness in the most challenging populations; they produce innovative solutions to the most pressing healthcare issues in their communities. They reach beyond the walls of conventional medicine to address the factors that may cause sickness, such as lack of nutrition, mental illness, homelessness and addiction. Because of their long record of success in innovation, managing healthcare costs, and reducing chronic disease, leaders in Congress have declared health centers a model of care that offers a “bipartisan solution to the primary care access problems” facing our nation. With continued support from public officials and policy makers, as well as the tireless dedication and work of providers and staff, the legacy of community health centers will live on through future generations and continue to make positive impacts within the communities they serve. About Bronx Community Health Network, Inc.
Bronx Community Health Network, Inc. (BCHN) is a non-profit Federally Funded Health Center that sponsors 17 community- and school-based health centers, owned and operated by Montefiore Medical Center and the Acacia Network. Serving more than 100,000 individuals from the Bronx each year, BCHN health centers offer Bronx residents affordable, quality medical care and related health services regardless of immigration status, race/ethnicity, sexual orientation, age, or ability to pay. Through its centers, individuals have access to comprehensive patient-centered care, including support services such as social workers, health educators, and nutritionists. Through its community based programs, BCHN promotes healthy lifestyles through health-related events; and links and refers community members to health care and other social support services. To find out more, visit bchnhealth.org. Union Community Health Center (Union) is a not-for- profit Federally Qualified Health Center providing approximately 180,000 visits each year to approximately 40,000 individual patients at its six locations in the Bronx. Union’s mission is to provide comprehensive, culturally competent primary and preventive health care services to improve the health and decrease health disparities of the medically underserved populations in the Bronx, providing services to all regardless of age, race, ethnicity, sexual orientation, religion or the ability to pay. To learn more about Union Community Health Center, visit www.uchcbronx.org. The Fordham Road BID is a non-profit corporation under contract with the City of New York to provide supplementary services to the community. The BID focuses on sanitation, beautification, promotion and overall advocacy of the Fordham Road area – striving to make the district a more attractive and dynamic locale in which to shop, work and visit. The BID boundaries extend from Washington to Jerome Avenues along East Fordham Road and also includes the commercial areas on select side streets. The district is comprised of approximately 80 buildings and almost 300 businesses ranging from nationwide chains to locally owned independent shops.